How do we know that the cremas/gas chambers at Auschwitz-Birkenau were not air raid shelters for the German guards? The cremas/gas chambers at Auschwitz-Birkenau were actually air raid shelters. They were equipped with gas-tight doors to protect the people inside from poison gas. 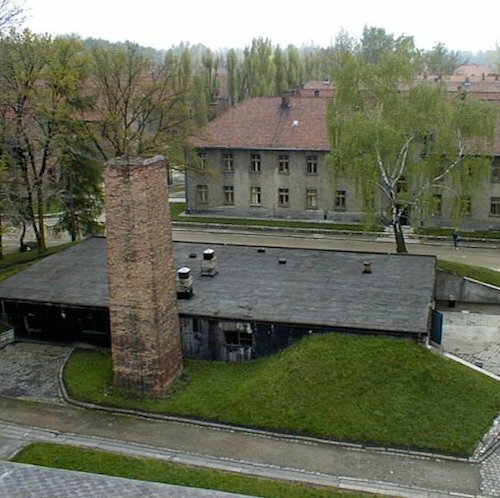 The Nazis used Crema/Gas Chamber 1 in the Main Camp (Auschwitz I) as a gas chamber for part of 1942. In November 1944, this became the only gas chamber that the Nazis transformed into an air raid shelter. There is no evidence that the cremas/gas chambers in the Birkenau camp were ever used as air raid shelters; they were too far away and completely unsuitable for this purpose. Instead, the camp administration installed smaller shelters around the perimeter of Birkenau. The issue of the gas-tight doors is a red herring because the Nazis ordered these doors 22 months before the issue of air raid shelters ever presented itself. Allied air raids took in the Auschwitz-Birkenau area took place late in the war. In August 1944, Allied planes began to appear in the skies over Auschwitz-Birkenau. On August 20, September 13, December 18, and December 26, 1944, the Allies mounted air raids on the nearby Buna synthetic rubber factory and I.G. Farben industrial complexes. These huge factories were sub-camps of Auschwitz-Birkenau, from which they got their slave labor. On the way to Buna and I.G. Farben, the Allies took reconnaissance photographs as they flew over the Main Camp and Birkenau. In the September 13, 1944, raid, a targeting error caused bombs to fall on the camp area of Auschwitz-Birkenau, killing 15 SS men and 40 inmates in the Main Camp as well as 30 civilian workers at Birkenau. Only in late 1943 did the Central Construction Office at Auschwitz-Birkenau, on orders from Berlin, begin to build air-raid shelters in both the Main Camp and Birkenau. In Birkenau, they opted to build one- and two-man shelters. These were placed at regular intervals around the perimeter of the camp. These smaller individual shelters had an advantage: they were close by and were open in the direction of the prisoner compound so that the SS guards could continue to cover the perimeter while using them. In Auschwitz I (the Main Camp), Crema/Gas Chamber 1 was an obvious choice for an air-raid shelter because the SS guards could quickly take cover there in the event of a raid. The holes in the roof, through which Zyklon-B was once poured, were filled in. The plan for the air-raid shelter was dated September 1944 and shows that they constructed additional walls in the gas chamber room. The reason was to provide better support for the concrete roof and to minimize any damage if a bomb penetrated it. It already had a gas-tight door and an extra door was added as an emergency exit. No further construction was necessary. Finally, although Crema/Gas Chamber 1 in the Main Camp was perfectly suited for use as an air raid shelter, the four cremas/gas chamber buildings in Birkenau were too far away to be useful in an air raid. Some of the SS men would have had to run over a mile to take shelter there. The guards would also have had to abandon their posts in the process. That is why the Nazis converted 176 concrete units into individual units scattered around the perimeter. Why do Holocaust deniers say that Auschwitz-Birkenau authorities planned to build air raid shelters as early as 1942? On January 1, 1943, three gas-tight doors were ordered for Crema/Gas Chamber 2. On February 26, 1943, ten gas detectors were ordered by telegram from Topf & Son Gas detectors would be needed to determine when it was safe to enter the gas chamber rooms and remove the bodies. On March 31, 1943, one gas-tight door was ordered for Crema/Gas Chamber 3. The Nazis ordered all of these items in early 1943 for the gas chambers. The Auschwitz-Birkenau authorities only began to build formal air raid shelters in October/November 1944, some 22 months later. Likewise, the small open one-man air-raid shelters scattered around Birkenau’s perimeter in 1943 required none of the gas-tight features. Irving claims that the files of the Central Construction Office in Auschwitz-Birkenau showed that the Germans were concerned about taking precautions against Allied air raids, as early as mid-1942 and onwards. Irving suggests that they “began to consider the construction at the camp of shelters, splinter trenches, and other Air Raid Precaution (ARP) measures.” Perhaps, he asserts, the Auschwitz-Birkenau authorities were “concerned” about the possibility of future air raids in 1942. However, the Nazis’ own records show that they did not begin to seriously consider building air-raid shelters until October 1943. They only started actually building them in October/November 1944, after the September 13 air raid. According to Robert Jan van Pelt, who reviewed Nazi documentary evidence for the 2000 Irving-Lipstadt/Penguin libel trial in London, “None of the documents…mention any crematorium or morgue, or a plan to convert a morgue of any crematorium into an air-raid shelter…Furthermore, none of the documents…mention any intended or executed construction of an air-raid shelter in any of the Auschwitz camps before November 1943.” The first mention of any activity relating to building air raid shelters is a memorandum of a meeting held on November 9, 1943, where there was a basic discussion of what preparations should be taken. A memo from that meeting indicated that only construction of a splinter trench, for a hospital operation room, had just begun. Van Pelt concludes: “The only issue of concern in Auschwitz before November 1943 was the problem of enabling the camp to adhere to blackout rules and the creation of precautionary measures, including the installation and maintenance of fire extinguishers in various buildings, and the creation of fire ponds to serve as water reserves in case of an attack with incendiary bombs.” Thus, Irving’s suggestion that a sense of urgency about Allied air raids existed from 1942 on is not supported by the evidence. Aerial view of Auschwitz. Photo by Ryszard Domasik. [GFDL or CC-BY-SA-3.0], via Wikimedia Commons. Why the doors in the cremas/gas chambers in Auschwitz-Birkenau open outwards. When the Nazis originally designed Cremas/Gas Chambers 2 and 3, the doors swung open into the morgue rooms. As existing blueprints show, when they modified the rooms, from morgues into gas chambers, the doors were re-designed to swing open outward from the room. The doors were re-designed in this way because otherwise the Sonderkommandos would not have been able to open the doors and remove the bodies of their victims. The victims who died by the door would have blocked the doors from opening. By contrast, air raid shelter doors are designed to swing open into the room. This is the case so that if rubble piled up outside the door, the people inside would not be trapped. Arthur R. Butz, “Vergasungskeller” at http://codoh.com/library/document/1026. Samuel Crowell, “Wartime Germany’s Anti-Gas Air Raid Shelters: A Refutation of Pressac’s ‘Criminal Traces’” at www.ihr.org/jhr/v18/v18n4p-7_Crowell.html. Transcript, Day 8, January 11, 2000, p. 101 at https://www.hdot.org. A picture of these small shelters can be seen at http://nizkor.org/ftp.cgi/camps/auschwitz/images/1998/Keren/air-shelter.jpg. Robert Jan van Pelt, The Case for Auschwitz: Evidence from the Irving Trial (Indiana University Press, 2002), p. 316, see floor plan dated September 1944. Robert Jan van Pelt, The Case for Auschwitz: Evidence from the Irving Trial (Indiana University Press, 2002), p. 314. Robert Jan van Pelt, The Case for Auschwitz: Evidence from the Irving Trial (Indiana University Press, 2002), p. 319. Transcript, Day 32, March 15, 2000, p. 178 at https://www.hdot.org. See also David Irving, “New Documents on Air Raid Shelters at Auschwitz Camp” at www.fpp.co.uk/Auschwitz/docs/LSKeller/MoscowDocs.html (documents in German). For English translations of the documents see “Documents from Moscow Archives describe building of air-raid shelters at Auschwitz-Birkenau in 1943-44” at http://codoh.com/library/document/908. Robert Jan van Pelt, The Case for Auschwitz: Evidence from the Irving Trial (Indiana University Press, 2002), pp. 326, 327. Robert Jan van Pelt, The Case for Auschwitz: Evidence from the Irving Trial (Indiana University Press, 2002), p. 328. Robert Jan van Pelt, The Case for Auschwitz: Evidence from the Irving Trial (Indiana University Press, 2002), pp. 314, 401. Robert Jan van Pelt, The Case for Auschwitz: Evidence from the Irving Trial (Indiana University Press, 2002), pp. 311, 401. Robert Jan van Pelt, The Case for Auschwitz: Evidence from the Irving Trial (Indiana University Press, 2002), pp. 314, 315. Robert Jan van Pelt, The Case for Auschwitz: Evidence from the Irving Trial (Indiana University Press, 2002), p. 377. Robert Jan van Pelt, The Case for Auschwitz: Evidence from the Irving Trial (Indiana University Press, 2002), p. 317.